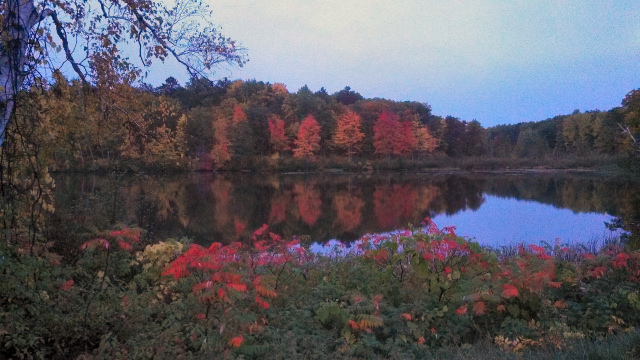 The beauty of Wisconsin’s northwoods always captivates me, especially during fall. As summer dwindles away, the trees begin their gradual color change; I always first notice the deep summer greens fading into light green. The hillsides become speckled with lighter green trees as the red hues begin to pop out from nowhere. Soon, the entire landscape here is a mixture of breathtaking reds, bright oranges and yellows. Then, and it always seems suddenly, it is all gone – the roads, woods and hillsides are covered with a carpet of colorful leaves for a while, which finally turn to a crunchy, drab brown clutter as the last stubborn oak trees give up their leaves to the earth. 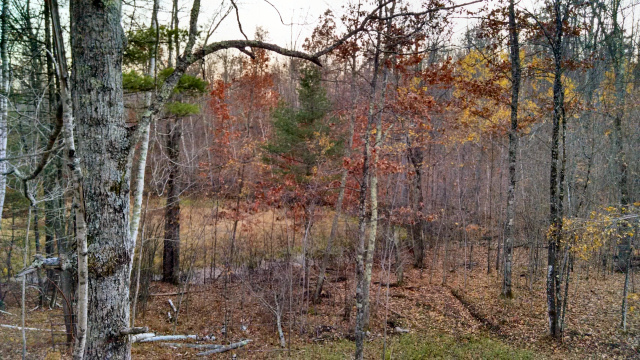 I see the landscape changing daily from my tree stand in the woods. When the colors are still so vibrant, a windy day will create a shower of acorns from the oaks, and suddenly the squirrels are everywhere, collecting their winter fare. As the colors just begin to fade, a windy day will whip up a pretty storm of fluttering leaves. Lastly, the rust colored oak leaves turn to their dirt brown color and let go. Finally, my view through the woods is only of bare grayish tree trunks and a brown blanket of leaves covering the forest floor. The few pines that were hidden during summer, are now in their glory – their green branches seem so striking against the dull landscape. I love watching all the wildlife from my tree stand The sparrows and wrens flip through the grounded leaves, making quite a ruckus for such small birds, and there are so many other birds-each with different habits and songs. I have to borrow my daughter, Kelly’s, bird identification book and find out what they all are. Last night, I even had a lone turkey march down the hillside and straight to the food plot. A few does, already there grazing, watched as this large, dark blob waddled down the hill noisily through the leaves. One curious doe looked like she wanted to play with the turkey – she sniffed it, cocked her ears and threw her head, trying to get some response from the large bird, who just went on pecking at the ground. There is always a symphony of bird songs and noises in the woods, some are abrupt; a still, quiet eve always brings out the owl with its loud and sudden ‘hooooo’. The chipmunks are funny little creatures to watch. They are never still, always running here and there through the leaves, on endless missions-I’ve mistaken them for deer coming in many times now! There are both gray and black squirrels in these woods and I like to watch them at their busy gathering work, chattering at each other. I wonder if they remember where they store all their nuts? The temperatures have been hovering between 35-40 degrees these last several evenings, and although cold, it is a blessing to not have those pesky mosquitoes buzzing around while I am trying to be quiet in the stand! One recent night, after a beautiful warmer day, I couldn’t believe it, but a few mosquitoes were circling my head-despite the cold evening air. I have to admit, I feel very fortunate to be able to experience all this this beauty in the northwoods of Wisconsin! I better get going, I have a lot to see! This entry was posted in Hunting, NORTHWOODS LIFE, Scenic Observations and tagged birds in hayward wi, bow hunting, bow hunting hayward wi, Deer hunting, deer in hayward wi, deer stand hayward wi, fall in hayward wi, Hayward, northern wi wildlife, wildlife in northern wi. Bookmark the permalink.